I love this post from Rosie on how our place in a sports team or on a pitch can be used to witness to others of the great news of Jesus. This is a lesson I wish I'd learnt sooner - so take note girls! I love the thrill of being on the pitch; running, jumping, diving, catching, throwing. If I could do it all day I would! My faith in Jesus is the biggest part of my life. I am so grateful to him for dying for me, for forgiving me, and enabling me to know him personally now and forever. It took a long time to click for me that those two things could be, and are, totally related. It took me a while to understand that my sport can be a way of actually worshipping God when I give it back to Him. And it took me a while to see that the world of sport is an amazing opportunity to share my faith with others. Look at what Jesus said to his disciples after he had risen from the dead, and before he ascended to Heaven: 'Then Jesus came to them and said, "All authority in heaven and on earth has been given to me. Therefore go and make disciples of all nations, baptising them in the name of the Father and of the Son and of the Holy Spirit, and teaching them to obey everything I have commanded you. The call is for all of us, as Jesus’ disciples, is to go and make disciples. And where are we told to go? To all nations. That means all people groups. And as I think about which people groups I naturally spend time with, it makes complete sense to go to sportspeople! I absolutely love my team. We get on brilliantly together, we work hard for each other on the pitch and love hanging out off the pitch. We spend a lot of time together, in training and in tournaments, and socially as well. We go through a lot together – fitness sessions in the freezing rain, training week in week out, the heartbreaks and the joys of a season together! What a foundation and opportunity that is to share life and the Gospel with them! These are a bunch of girls I really care about. Why then would I not want to share with them the best news in the world? The news which has saved me, giving me this amazing relationship with Jesus and the hope of eternal life? Now the idea of this scares me sometimes. How in the world could I ever bring it up in conversation? What if they had questions I didn’t know how to answer? What in the world would they think of me? But in these verses Jesus gives us amazing assurances. He has ALL authority in heaven and earth – he has just risen from the dead and smashed death to pieces! He promises to be with us ALWAYS, to the VERY END OF THE AGE! What a comfort to know that Jesus, all-powerful Jesus, is with me as I go to make disciples. v2-4 Devote yourselves to prayer, being watchful and thankful. (3) And pray for us, too, that God may open a door for our message, so that we may proclaim the mystery of Christ, for which I am in chains. (4) Pray that I may proclaim it clearly, as I should. v5 Be wise in the way you act towards outsiders; make the most of every opportunity. v6 Let your conversation be always full of grace, seasoned with salt, so that you may know how to answer everyone. 1. Pray for your friends in sport, that you would have opportunities to proclaim the mystery of Christ. 2. Play in a way that honours God – let’s be wise in the way we act on and off the pitch as that can lead to opportunities! 3. Say something of the Gospel. Let’s take those opportunities when they come, speaking about things with eternal value. The world of sport needs the Gospel, and we Christians in the world of sport have an incredible opportunity to tell people the most amazing news in the world! 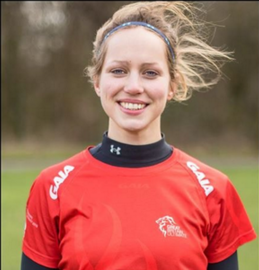 Rosie is currently living in Bicester working for Christians in Sport - a movement of people passionate about sharing the gospel with sportspeople. She spends most of her time playing ultimate frisbee and is looking forward to getting married in May!